Eric Hoffer was one of the great thinkers of the 20th century. A simple longshoreman from San Francisco, Hoffer wrote several books, the most famous being “The True Believer.” He was an intellectual who was mostly self-educated. There is a treasure trove of letters and journals available for study at Stanford’s Hoover Institution. However, only a tiny portion of his jottings have been made available for publication to the public. Harper’s magazine got a glimpse back in 2005 (a must-read called The Art Of The Notebook). To give you an idea of just how much is at Stanford, the register of the Eric Hoffer papers describes the collection as, “142 ms. boxes, 3 cu. ft. boxes, 10 oversize boxes, 7 card file boxes…speeches and writings, correspondence, reports, minutes, memoranda, printed matter, and audiovisual material.” In other words: Hoffer Heaven. The Longshoreman Philosopher: A great piece from Tom Bethell. Tom Bethell has completed and published, Eric Hoffer: The Longshoreman Philosopher. 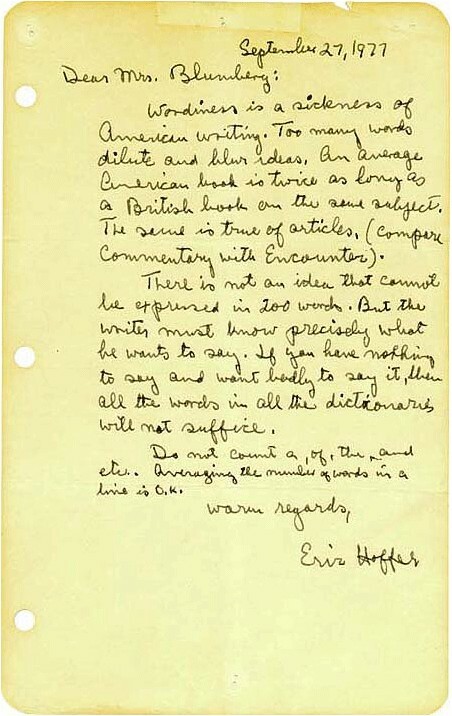 This new biography mines the papers from the Hoover archives of Hoffer material. Highly recommended! Check your local library for Hoffer books. My personal favorite is a journal he kept from June of 1958 to May of 1959; it was published as “Thinking and Working On The Waterfront.” If I’ve read it once, I’ve read it a few dozen times. Discover Eric Hoffer. One of the great philosophers, notebook keepers and – a national treasure. “By circumstance and perhaps also by inclination, I think in complete intellectual isolation.